Scott No 248a, Edifil 191c 2c Maximo Gomez, single stamp from booklet pane of 6, position buttom left. Revenues stamps.Consejo Provincial de Matanzas. Cat McP.Jones PM1,PM3 perf. 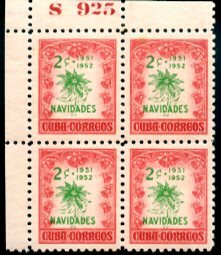 Revenues stamps.Consejo Provincial de Matanzas. Cat McP.Jones PM1, PM3-4, PM7 perf. mint. Cuba Libra Isue (not issued). Mint original gum, paper remanent. Postmark. Bejucal/Isla de Cuba, double circular, (bull eye) on Scott 105, 1883. Nice strike. Scott No 470 Blk4 w/Pl# 925 Top left. MNH. Some tropical stain spots Cat as sgls 22.00. Scott 499 3c. Christmas 1952. Blk4 w/Pl # S928 Top left.MNH. center displaced to right. Scott C182-84 Carlos de la Torre. Sgls w/Pl#. right bottom. Mint. Scott 375-79 Fith Column. Sgl w/Pl#. Top left. Mint. Scott C37 10c Colombus Blk4 w/pl# 577 and folio number, top left. mnh. Scott 229. Block of 10 with partial inscription and arrow line. Mint nh 6 stamps (8.75 each) and 4 stamps with hinge(3.50 each). Total Cat. value 67.50 as singles. Scott 223. Block of 4 mint hing remmanent. Some paint spot on the back from other stamps. PMK- HABANA big letters on 9 Scott 248. Piece. Scott B2 5c Madam Curie, Blk4 used. Nice piece. Postmark-Circular - Guaro, Oriente, Oct 18?,19? ?, heavy strike, on regular envelope addressed to Philadelphia, USA. Stationery-Edifil #43. 2c on cream Type I Unused.